With so many cases looking virtually identical, we designed this set to stand out – a bright pink band means you’ll easily spot your cases on the carousel, and it looks good too! 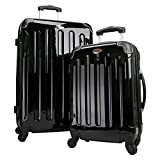 Put together with the traveller in mind, this set features one 28″ suitcase for checking in, and one 20″ suitcase suitable for carrying onto the plane. This entry was posted in Luggage and tagged Case, EZ2C, Fluvo, Suitcase, Swiss, Wheel by Perfect Vacation. Bookmark the permalink.